About Map: Map showing location of Venezuela in the World. The Venezuela location map shows that Venezuela is located in the northern part of South America continent. 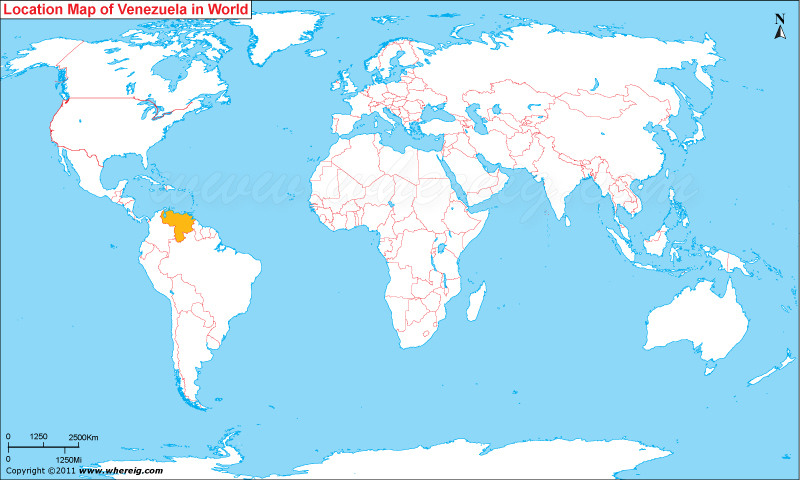 Venezuela map also shows that it shares its international boundaries with Guyana in the east, Brazil in the south, and Colombia in the west and north-west. Besides, Caribbean Sea lies in the north. The climate type of the country is tropical with distinct seasons. Venezuela was a Spanish colony and it declared its independence in the year 1811. Caracas is the largest as well as capital city of the country. The government type of Venezuela is a federal republic featured with multi-party system. Under this system, the chief executive is President of the country; hence, the President is head of government as well as head of state. In Venezuela there are five branches of government namely Executive, Legislative, Judicial, Citizen, and Electoral. Besides, Venezuela is a member of the United Nations, the Organization of American States, the Organization of the Petroleum Exporting Countries (OPEC), the World Trade Organization, the Group of 15, the Bolivarian Alliance for the Americas (ALBA), and the Union of South American Nations (UNASUR). The economy of the country largely depends upon the oil reserves. Venezuela is leading oil exporting country of the world. The other significant manufacturing industries are steel, aluminium, cement, electronics, and automobiles. The important crops are rice, corn, coffee, and tropical fruit. Besides, fishing is also an economic activity in the country.